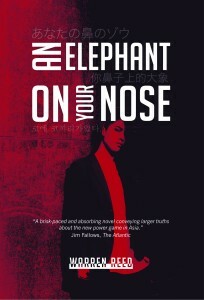 Another brilliant review for An Elephant On Your Nose by Warren Reed is available here. Don’t forget to grab your copy now! We’re thrilled to say that ‘An Elephant On Your Nose’ by Warren Reed is already receiving glowing reviews from around the world. Check it out here, and click below to order your copy now! Spies often come in for a bad press, in real life and in fiction, for their bungling and their treachery. More often than not, it’s the mistakes and betrayals that come to the attention of the general reading public. An Elephant on your Nose presents a different view. We’re just one week out from the launch of Warren Reed’s page-turner An Elephant On Your Nose. Our good friends at Living Arts Canberra sat down with Warren to talk about the book, his life as an ASIS agent and his history with writing thrillers. by Warren Reed, former ASIS agent and celebrated authorPre-order Warren's new spy novel 'An Elephant On Your Nose' here. Wherever we travel, people in the countryside are generally more direct and down-to-earth than those in big cities. This applies especially to Japan, which is odd in the sense that Japan is comparatively small in geographic terms. As the crow flies, the distance between Tokyo, Nagoya and Osaka and any point deep in the Japanese Alps is a mere hop, step and jump compared to Melbourne and Sydney and a point in the outback. Japan has recently become a favourite of international tourism and with the country's network of high-speed trains more foreigners are venturing off the beaten track than ever before. Australians, particularly those lucky enough to be posted overseas, are inveterate travellers. Working in the Australian Embassy in Tokyo decades ago, many of us were already visiting out-of-the-way places. We'd heard of a well-known (to the Japanese) Saturday market at a fishing village on the northern tip of the Noto Peninsula, which projects out into the Sea of Japan from the inner-elbow of the main island of Honshu. We arrived just as the market got under way. The fishermen were selling their catch at the quayside, while a dozen or so old Japanese women sat cross-legged on blankets nearby with fruit and vegetables they'd grown themselves for sale. Most were in their mid-eighties and had probably been widowed during WWII. You could feel the bond between them and their impish sense of humour. One of them heard me speaking Japanese and called out, "Hey, Mr Foreigner! Don't waste your time with those old birds. Come over here and give me a thrill!" I marched over like a soldier and stood in front of her, clicking my heels and saluting. "Now, let me think," I said, as the other women listened. "What can I tell you?" 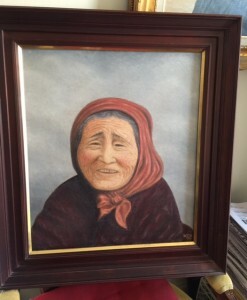 "If you're stuck for words," the old lady quipped, "let me tell you something." The others seemed to know it would be saucy. "If I were seventy years younger," she said, "I'd whip you back to my place up on the hillside there and give you a time you'd never forget!" The other women were in stitches. "Damn it!" I replied. "I knew I should have come up here long before this." "Watch out!" one of the other women joked. "She's still up for it." The old lady let me take her photo so I could do a portrait of her back in the capital. Naturally, a condition was that I send her a photo of it later, which I did. I tried as hard as I could to capture her impish grin. A similar thing happened on a trip to the renowned pottery of Bizen in western Japan. I was driving my Honda Civic and had three Japanese friends onboard. We came over a saddle in the hills on a narrow, less-travelled road and as I glanced down to the terraced rice-fields below I spotted a farmer cutting the tall weeds that had grown up between the rice paddies. He happened to look up as I spotted him. He was only about 150 metres away. I jammed on the brakes, grabbed my camera and ventured down to where he was standing. He wasn't unduly surprised and was pleased when I spoke to him in Japanese. "Even from up on the road there," I said, "I could see your wonderful, lived-in face." 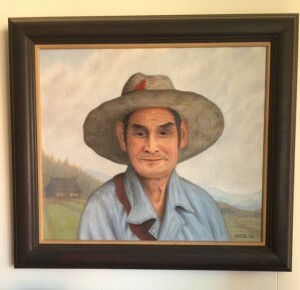 I explained that I was down from Tokyo and often painted portraits, usually from photographs I had taken. "OK," he said with a casual air. "How do you want me? My old lady thinks this is my best profile, but the pesky young woman I catch up with in the local town prefers this one. Anyhow, as a man you can just take me full-frontal! How does that sound?" Now I was in stitches. It was such a natural exchange and typified a side of the Japanese I came to love very much. I sent him a photograph, too. Rising star MI6 agent, Isabella Di Stefano Butterfield, has been dispatched to Tokyo to assist the Japanese in establishing their own intelligence organisation in the lead up to the 2020 Olympics. But before discussions even commence, Japan receives disturbing intelligence about a home-grown terror plot from an unlikely source – China. Bella is thrown headlong into a complex, multinational espionage operation, forcing her to walk a trip-wire of hidden agendas that sorely test her professional and personal loyalties. We’re so excited to have announced pre-orders for author and former ASIS agent Warren Reed’s newest book ‘An Elephant On Your Nose’. Here, Warren writes about some of the background to the book. You can order your copy now by clicking here. The comparatively small numbers of Australians who have studied, worked and lived in Asian countries know how important it is to understand how history has shaped those nations. For example, a few years ago we were saturated with news about the Senkaku Islands – which the Chinese call the Diaoyutai – that are south of Okinawa. The Senkakus are administered by Japan but are claimed by the Chinese as their own traditional territory. Though the Senkakus have now dropped out of the media completely, they were until recently seen to be a possible flashpoint for military conflict between Japan and China. Coastguard ships and naval destroyers were patrolling the area and it seemed that skirmishes were about to take place, which could escalate into something far more serious. No one in the media, even in Japan, bothered to check out the history of the islands, beyond countering China’s historical claims. Despite China’s assertions, there was an incident just under one-hundred years ago that tells a very different story. In November, 1919, a Chinese fishing boat from China’s Fujian Province – 15.6 metres long, with a beam of 5.4 metres and powered by sail, rather than an engine – was fishing in Japanese waters off the Senkakus. Thirty-one men were aboard, mainly from one family, with the eldest aged 60 and quite a few youngsters aged between 11-16. A typhoon struck, seriously damaging the vessel, and to save it the crew had to cut the mast away to avoid capsizing. The storm raged for more than a month, with the crew tossed about by the wind and waves and drifting helplessly as they attempted to repair their boat. In late December, with no improvement in the weather they found themselves again within sight of the Senkakus but unfortunately their vessel was so badly damaged that it sank. The crew managed to save themselves by taking to three small dinghies they had on board. They carefully made their way to the Islands, where Japanese fishermen from the settlement there spotted them and helped bring them ashore. They were looked after by the Japanese and their health and spirits restored until the storm finally abated in mid-January 1920. As a result of this, no lives were lost. The leader of the Japanese settlement then took them in his fishing vessel to Ishigaki Island, which is part of the Japanese island chain that stretches all the way from southern Kyushu to Formosa: now Taiwan but then Japanese territory. Ishigaki City was the administrative headquarters and was the centre of activity in the southern region of the Prefecture of Okinawa that governed the overall island chain from Naha, the capital. The Chinese crew stayed in the city for ten days while their health improved, after which they were taken by the regular ferry service to the port of Keelung in Formosa. From there, they were repatriated to their hometown in Fujian. There were numerous communications at the time about the rescue, between the Japanese mayor of Ishigaki and the governor of the Prefecture of Okinawa, as well as with the Ministries of Foreign Affairs and Home Affairs in Tokyo. Also in the loop was the Chinese Consul in Nagasaki in the north-western part of Japan’s Kyushu Island, who wrote a remarkable seven official letters of gratitude in Chinese on behalf of the Government of the Republic of China. All of the key Japanese involved in the rescue and repatriation of the crew were thanked, and all expenses incurred by the Japanese reimbursed. A gratuity was also included by the Chinese in appreciation of the assistance the Japanese had rendered. All of the official documentation raised at the time, in both Chinese and Japanese, still exists in the archives. The letter that the Chinese Consul sent to the leader of the Japanese settlement in the Senkakus was lodged by his eldest son in a museum in Ishigaki City in the 1990s. There was never any dispute at the time over the fact that the Senkaku Islands belonged to Japan. Also little known is that Okinawa itself, once the centre of the Ryukyu Kingdom, was a tributary state of China. For some centuries after the various islands in that chain were unified by the Okinawans, who were not Japanese, it was a focal point of booming Asian maritime trade. Vessels from Southeast Asia and beyond would unload their cargoes there, which were them divided up for transhipment to various ports on the China Coast. Many Chinese administrators lived there and coordinated this trade. So, when we hear about China’s claim on islands in the East and South China Seas, we need to be mindful that history can often tell us much more than what’s presented to us by media reporters averse to a quick Google search before putting pen to paper. Quite some time back I was a researcher for three years in the Law Faculty of Tokyo University. Everything was in Japanese, so it was quite a challenge at first, but well worth the effort – the sort of effort you can only make in your twenties. Once a week, a discussion group of Japanese researchers and a handful of foreigners got together to analyse international events. A researcher would be given a topic to work on for weeks ahead and on the designated day would make a presentation for an hour followed by a Q & A session. The meeting was often chaired by the dean (who’s like God in Japan). Thankfully, he was a considerate man who understood the effort we foreigners had to make to perform in this way. Japan’s prime minister had then recently been on a visit to Asian capitals and violent anti-Japanese riots had taken place in each city. Demonstrators didn’t just carry placards in the street; they were pushing huge neon signs advertising Japanese products off the tops of buildings and burning Japanese-made cars. I’d seen it on TV in Tokyo and was amazed at the virulence displayed. The dean allocated the topic to me for a month or so ahead. The question I had to address was, “What are we Japanese doing wrong?” I was told I could be brutally frank; they wanted the raw truth, as seen through the eyes of an Australian. I set about this task with gusto. I already had friends in the Asian student community in Tokyo and they helped get me in to interview ambassadors and a wide range of Asian business people living there. They were all quite candid and some extraordinary stories emerged about Japanese habits overseas. There was little that was downright bad. Rather, there was a cultural insensitivity towards the local staff in a variety of contexts. In say, a Japanese-run manufacturing plant in Indonesia or the Philippines, Japanese managers would take lunch together in their own canteen, quite separate from the locals, some of whom were highly qualified engineers. No locals were ever invited to play golf with their Japanese managers, or go drinking after work. All of this went into my presentation, which was not to be a written speech read aloud. One was expected to speak from bullet points but nothing more. I used a polite form of the Japanese language to relate what I’d learnt. Everybody listened quietly, with erudite nods here and there. When I finished, the dean asked for questions. Hardly anyone said anything and a drawn out silence followed that was agonising. I was trying to work out what I might have unwittingly said that had mortified everyone. The dean, by the grace of God, eventually changed the subject and we moved on to discuss something else. At the end of the meeting, the dean invited me to drop by his study for a chat, which suggested I’d put the wrong inflexion on a word I’d over-used and which had a horrific meaning to the Japanese. I was about to find out. The dean welcomed me and asked me to relax. He congratulated me on my presentation and the effort I’d put into preparing it, adding that he would have hated having to do the same in English. I took the dean’s words to heart and they’ve served me well ever since. At the time, I put all of this in a letter to my parents back home. My father sent photocopies to everyone else in the family. (Warren Reed was an Australia-Japan Business Cooperation Committee scholar at Tokyo University at a time when Japan’s economy was starting to boom). We're so excited to have announced pre-orders for author and former ASIS agent Warren Reed's newest book 'An Elephant On Your Nose'. Here, Warren writes about how we came to the book. You can order your copy now by clicking here. Half a century ago, the Japanese economy took off and drew Australia into Asia’s orbit like never before. Japan was followed by the rest of the “Asian tigers” and then China dwarfed all of that put together. Through all of this, significant numbers of Australians ventured into the Asian world to study, to live, to work and to establish long-lasting personal and professional relationships. In this process, these Australians have been able to observe up close the ways in which the peoples of Asia themselves relate to each other. The mechanics of all this can be complex, not just to understand but also to convey to fellow Australians. There aren’t many books around that do that. Clearly, anyone who writes novels typically draws heavily on their own life experience and that’s what I’ve attempted to do with An Elephant on Your Nose. I’ve always wanted to create a story that shows how the Chinese, Japanese and Koreans, for example, rub up against each other. What do the differences in culture mean in their inter-relationships? How do the legacies of history hover in the background? How are the hierarchies of Northeast Asia’s institutions structured and how do they differ from our own? I hope that this book illustrates some of that, and additionally what happens when a foreigner is thrown into the mix. Language proficiency isn’t the be all and end all of a foreigner’s experience in Asia, but it certainly helps. Above all else, it displays respect for a society and culture vastly different to our own. To be fluent enough to understand how humour and innuendo differ in various Asian countries provides wonderful opportunities for exchange. One of the world’s most commonly shared languages is that of laughter. It not only facilitates mutual understanding but also throws up a wealth of unintended mistakes that help different peoples to laugh with each other rather that at each other. There are other languages too, like that of silence, which in Northeast Asia can be wielded with the dexterity of a surgeon’s scalpel. These are the sorts of things that have helped define the story and the characters in An Elephant on Your Nose. I hope you enjoy it.